In this time of audio-visual bombardment, there still is great necessity for printing "on paper", not only in Business but for personal use as well. Many readers have asked for a some advice regarding the latest printer offerings. We've tested a few, and here's our recommendation for a high quality, cost-efficient, reasonably priced printer that should serve your needs. The Canon Pixma MX882 Wireless Inkjet All-in-One is a multifunction printer that offers good text and graphics quality with an array of features for both home and business use. The MX882 prints, copies, scans, and faxes. You can scan to e-mail and fax either from your PC or your computer. Ink Jet All-In-One Color or Monochrome. Automatic duplexer for printing on both sides of a sheet of paper with a 35-sheet duplexing automatic document feeder (ADF) for scanning, copying, or faxing two-sided documents. Uses five ink tanks, including both dye and pigment-based black. The text quality was above average for an inkjet. Text was dark and crisp, and small test fonts showed up well. Photo quality was terrific, with most prints as good as you'd get from a commercial photo lab. Colors were rich and well saturated, and color fidelity was good. 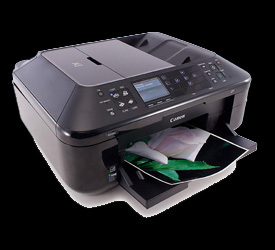 The Canon Pixma MX882 is a high quality, cost-efficient, reasonably priced printer that offers an excellent range of features that should support your needs for a long time. And it's backed by the reputation and name of Canon. For the latest and complete specifications: Click Here.